The paperwork mounts as I file reconsideration and waiver forms for Social Security Income (SSI). There are some weeks that I receive a letter from Social Security Administration (SSA) every day, sometimes two come in one day. Next in line for the appeal process is a hearing with an Administrative Law Judge (ALJ), which I found out today could take up to a year to schedule. Today, I spoke with a lawyer from the legal aid organization in our state. They have a file on us, but are not officially handling our case. It seems they will jump in after I have exhausted all appeals and waivers. They do offer advice on what paperwork to file and what steps to take to keep our case moving along. In another arena, Letters of Medical Necessity (LMN) have been added to my paperwork frenzy. Our local management entity, a private agency that manages the state resources for community programs for children and adults with specials needs, Medicaid, etc, has changed. The new company is efficient, organized and requires paperwork to back up any decision. Last Thursday night, I wrote letters to eight of Ben's providers requesting an LMN asap. Without Ben's therapists and doctors' support for services, Ben could lose the help he gets daily. The time spent on filing papers, writing letters and emails and phoning attorneys and case managers build to a point where I feel a tremendous amount of pressure and stress. For a moment today, I wondered if it was all worth it. What if I gave up, gave in and did nothing to find resources for Ben? What would happen if I stopped therapies, extra help with skill-building and personal care? To me, the answer is bleak: less independence, slower progress and definitely less interaction with others. I used to wonder when Ben was little, like two and three, if all of the therapy helped him - he made slow but steady progress back then, but I was skeptical of the therapies. I thought that he might make the same progress without people tugging and pulling on him for several hours a day. Because I was not willing to take the risk with my kid we continued. Now, I have a different attitude. I do think Ben has gained tremendously from all his work with the therapists. In the past couple of years, he has learned so much. He is capable of so much more. He still fights us because it takes a lot of energy for him to do anything, but he can do it and that means something. Ben did not get here on his own, it has been the countless hours of each therapist, community home worker and doctor that have helped him get closer to his potential. So, I put on my gloves, ready to fight. Our Family Weekend experience at Victory Junction was incredible and best shown through photos. It is the only way for you to see how much we did in less than 2 days. Not pictured, the Talent Show, Fab Shop (get your hair painted), 50's Rock & Roll Dance, tree house (accessible to wheelchairs), mini-golf, maze, arts & crafts area and wood shop. A pool & zip line are available during the summer. The families we met were all great. Kids made quick friends with our cabin neighbors. Our camp counselors showed us the ins and outs of the camp and activities. Personally, the camp wore me out. Ben was too excited at night to sleep and the eight twin beds in our cabin were too much for him. He had to travel from one to the other. This would not have been so bad had it not been 10pm at night and other family members were sleeping in them. Cabins for the campers and families. Dressed up for the 50's Rock & Roll Party. Victory Junction is in honor of Adam Petty. He died during a practice race in 2000.
grandfather and many other supporters helped make it happen. All cabins are named for Race Tracks. We were in the Rockingham Cabin. Dancing after breakfast and dinner. Always! Ben used a cross-bow at the archery station. He hit a bulls-eye. Sean caught a fish at the "Catch, Kiss and Release" station. Ben pet the donkey in the barn. The llamas wanted no part of him. Who knew you could paint horses? Logan is sitting in a real race car. Sean tested the idea that donkeys are stubborn. Ben's bowling technique: push the ball down the ramp while looking the other way. Race cars hung from the ceiling in the Fuel Stop, aka dining hall. and refused the option this time. Victory Junction is one of many similar camps in a partnership called Serious Fun Network, an international organization started by Paul Newman. The theme may be different, but the mission and goals and the way they are carried out are all the same. This camp ran with precision: the staff knew exactly what they were doing. I had no doubt that if there were an emergency, they would handle it immediately. Safety, comfort and fun were their priority. Families are able to attend camp more than once. I am already checking out the fall and spring weekends. I think I will be better prepared for the exhaustion next time and perhaps bring a small DVD player so Ben can have some low-key Bob the Builder time. If you want to make Ben mad, give him an activity that he sees no point in doing: make him throw a tennis ball to no one and then make him walk 10 meters in a particular direction that is not of his choosing. Ben participated in two events this year in the Track and Field Division of the Special Olympics Spring Games. He took silver for the walking event, and only threw the tennis ball when I stepped in to catch it. In contrast, Matthew, the son of my freshman college roommate and good friend, Karen, reveled in the games. He took a Gold for the 100m run and exclaimed, "I did it!" while he was on the platform. Last year he walked, but this year, he stepped up his game and ran the entire race. Each athlete is paired with a high school student at Charlotte Country Day School. 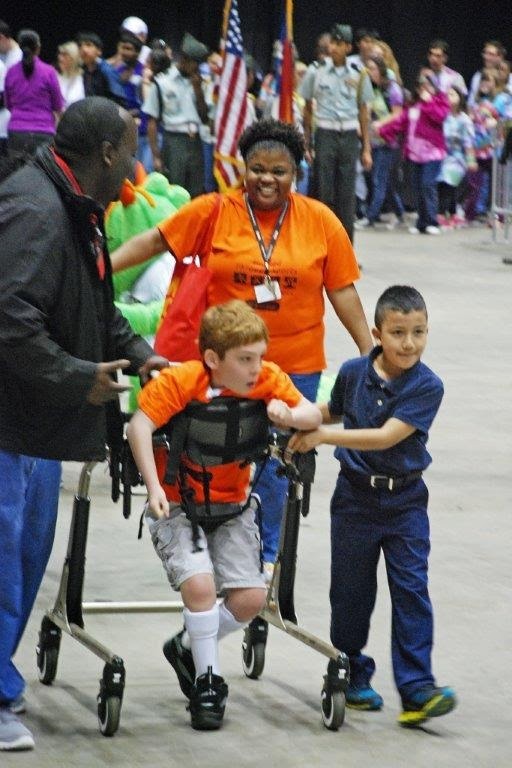 This year, Jacob, helped Ben get to and from his events, participate in the crafty activities and maneuver around the crowds. 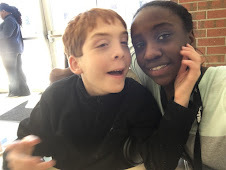 Jacob, although just a freshman, was an amazing mature, talkative and engaged buddy. It was his first time with this responsibility in the Special Olympics, and he handled himself like a pro. Charlotte Country Day School has been hosting these spring games for 31 years. All their students are involved on some level, from watching and cheering as an elementary student to being a buddy in early high school to planning events by the time they are seniors and juniors. The commitment the school has made to these games is obvious from the positive attitudes, happy faces and well organized events. My 10 year old son, Sam, and I attended the ceremony today after seeing your story on the news a few days ago. As soon as the story ended, he looked at me and asked if I would take him. Since we live in Gaston County, it is our spring break. I knew it was something we had to do! I felt truly blessed to be a part of today's events. I have been working with special needs children for almost 9 years now, and I realize just how special these kids truly are! Sam had an amazing time and is also proud of all of the athletes! Thank you for getting the word out! We hope to be there next year! Good luck Ben!!!!! I was debating on texting my son's teacher to find out what time and if the parents could go to the Opening Ceremony when I saw Astrid Martinez on WBTV yesterday morning. I ran into one of the cameramen for WBTV and thanked them for doing that news report in the morning. In all the years that my son has been going to these events I have never received any information giving the time, place of the events and saying come and join us. A few weeks in advance notice would be awesome, because many family members have to make arrangements to be there. I had a blast watching my son dance to "We Are Family." 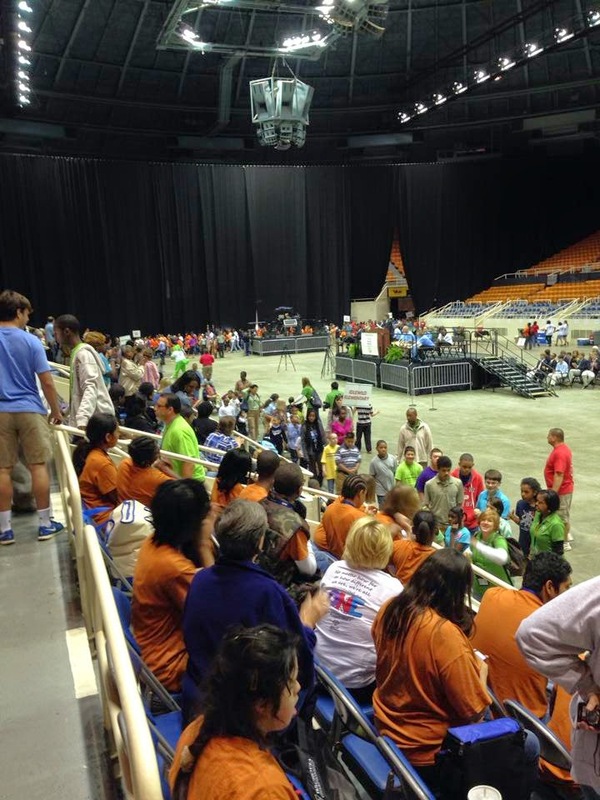 The pastor at our family's church, Sara Ilderton, attended the Special Olympics Opening Ceremonies on Tuesday. It was her first time attending, and the experience was quite more than she had bargained for. Pastor Sara writes a blog, and I have re-posted this with her permission, and added the photos to give a visual to her story. She has captured on "paper" what many of us felt. About a minute-and-a-half after the athletes started coming in, I wanted to knock Ethan out…He’s our Minister of Youth & Families. He was standing right beside me, and his constant “whoop-whooping” poured down on me from his 6’2” height and echoed throughout the entirety of the Bojangles Coliseum. 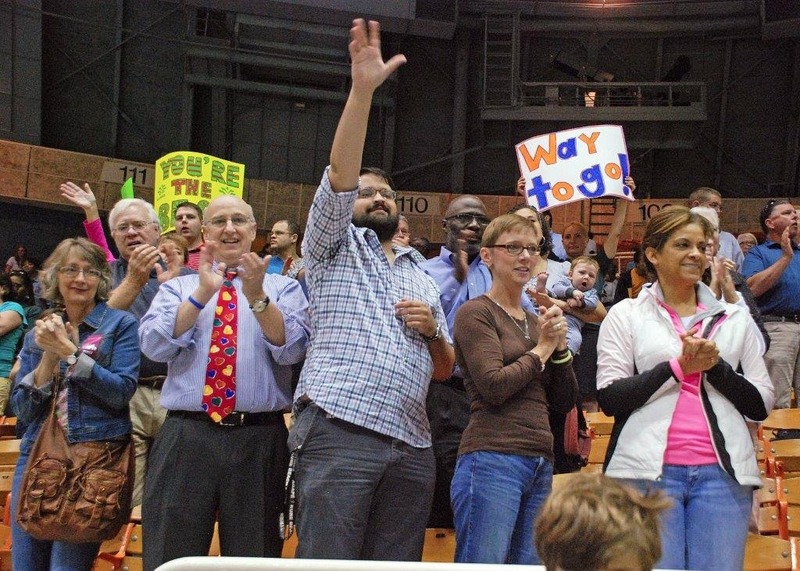 A bunch of us from the church went to support Ben – St. Luke’s own Special Olympian (check out eSpeciallyBen). Anyhow, Ethan’s excitement and enthusiasm were, quite honestly, more than a little annoying – at least at first. I’m fairly certain that every person there could hear him…which, of course, was the point. He made sure that every Special Olympian processing during the Opening Ceremony on Tuesday knew that they were supported, respected, seen, and cheered for. And before long everyone around, including me, took up his cause – whooping and whistling and shouting and waving for every single athlete (all 1,200 + of them) – like a bunch of crazy, star-struck fans just hoping that one of the athletes might look our way! And I know this sounds a little “hallmark-ish,” but I was experiencing (if that’s the right word), or sitting in the middle of, or being overwhelmed by irresistible and inexplicable joy (truly, truly inexplicable – so, please forgive this feeble attempt at making it explicable)! There, right before my eyes, the Kingdom of God took shape in Bojangles Coliseum. There, the world was turned upside down. There, the ones society calls the least and last, were now the first - the heroes and stars and champions. And we just wanted to be part of it! The love and joy and excitement were palpable. There was not the slightest hint of misplaced sympathy or condescension in the air – not one utterance of “that poor child,” not a single insinuation of pity. There was just Ethan (who recognized the Kingdom faster than I did) jumping up and down, waiving furiously, whooping until we all could not keep from joining in – celebrating the love and the joy and the inclusion of us all together in the presence of the Kingdom. Photo credit belongs to Terry Cheville, Sunday School teacher and photographer extraordinaire at St. Luke's. 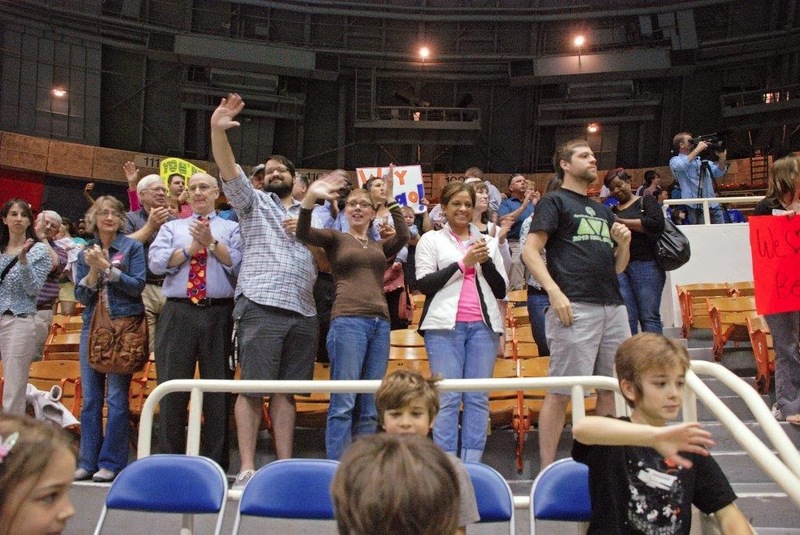 In 2013, my boys and I attended the Mecklenburg County Special Olympics Opening Ceremonies. We were 3 of perhaps 20 spectators. While we had an incredible time, I did wonder how much more fun and special the event could be if more people came to cheer on the athletes. I made myself a promise to bring more people along the following year. 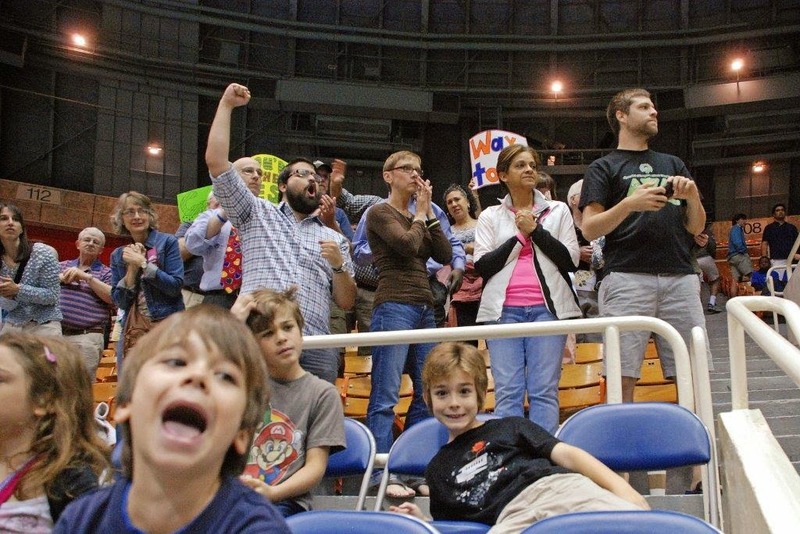 In late March 2014, I started a campaign called Operation: Fill The Stands. The name came from the photo below that I snapped while at the 2013 event. I am an "ask permission first" rather than "ask for forgiveness later" type of person, so I contacted Greg Morrill, director of the Mecklenburg Special Olympics to let him know what I had in mind. At that point of contact, I was hoping for a few extra people. With Mr. Morrill's blessing, I sent out 100 emails to family, friends and a few acquaintances expecting 20-30 more people to attend. 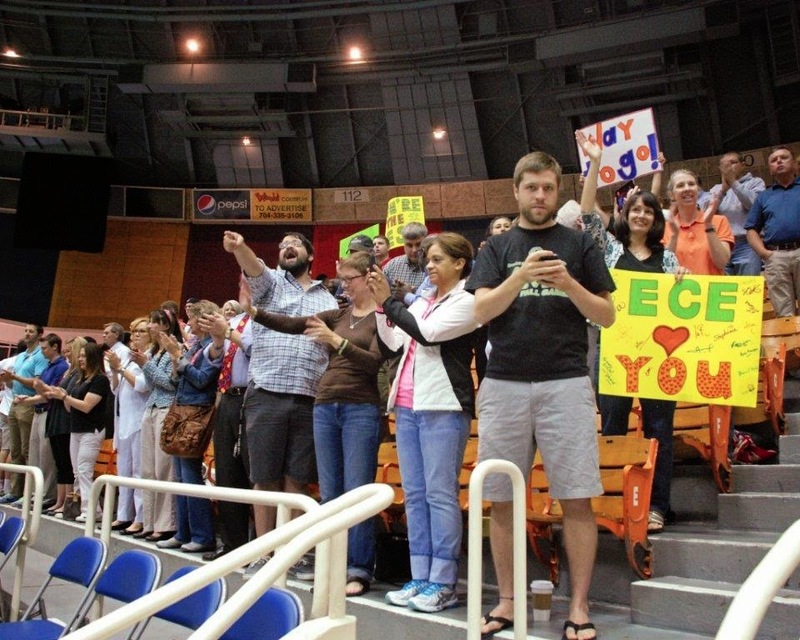 On my Facebook page and blog, I posted the photo and asked for ways to get more spectators. At first there was a trickle of interest and then over the weeks that followed, that interest grew. My expectations grew also. Perhaps 20-30 more people was not enough. What if there were a lot more people there? After a few phone calls and messages that showed me people were getting behind this cause, I had the courage to contact WBT radio personalities about giving their support - I listen to them often and knew that they did assist with events such as these. Within seconds of pushing the send button for an email to John Hancock, the 3-6pm radio host on 1110 WBT Radio, I received a message, "Absolutely!" An email foward and a church bulletin lead to a local news reporter, Sharon Smith, from WBTV interviewing Joey, Ben's community worker, on Easter Sunday. Once WBTV got the story, competition in the TV world took over and FOX Charlotte called me on Monday morning to setup an interview. Then Sharon Smith asked to meet Ben and talk with us on Monday. John Hancock emailed asking to talk with me that evening. It was a whirlwind of a day, but we made it through it all and the result was a lot of coverage for Operation: Fill The Stands. This snowballed into much more than I ever expected. Luckily, Mr. Morrill coped well with my ever increasing emails letting him know of more and more media requests. The links below show all the stories, interviews and TV coverage. The 2014 Opening Ceremonies for the Mecklenburg County Special Olympics were this morning. Our efforts to increase attendance worked. Last year, about 15-20 family members attended. This year, over 400 family, friends and community members cheered loudly for each and every athlete who marched into the Coliseum. There were many special moments while we were there. When Ben walked in (he was in his walker!!!) his personal cheering squads yelled extra loud. I was a few feet away from him, and I struggled with letting him see me or not. Often if he sees his family in a crowd, he wonders why he is not with us. But the decision was made for me, the crowd was so wild and loud, he could not hear me anyway. Just as he walked past me, I noticed him look up at the audience, then give a double take at all the people cheering. My tears came then and even now when I write this. While we were waiting for the ceremonies to begin, a woman introduced herself to me. She lives in Charlotte, saw the news about this event and came. She wanted to meet me and thank me. Her grandson is autistic and lives in Texas. We hugged. A connection made. For some, being a part of this event was a life changing experience. We think that as a member of the audience, we are giving our time and efforts to the athletes, but in reality, we, as meager spectators walk away with a lot more. Sometimes too much to comprehend. We have to let it sit until we can process the emotions. WBTV and WBT radio have already asked to be a part of the efforts next year to increase the audience. If the Special Olympics committee is open to it, I am a willing volunteer. But I have a feeling it will be easy to get people next year to come, once you have experienced the ceremonies, you will tell everyone about it and make it a tradition to attend. It is that good. Our grassroots effort to raise awareness and attendance at the Special Olympics Opening Ceremonies is paying off. One of Ben's community workers, Joey, forwarded the information about Operation: Fill The Stands to his church. It was in the church bulletin yesterday, read by one of the members who happens to be a reporter, Sharon Smith. She contacted Joey and the story was born. And with a little competition between news stations, the story got picked up by another local channel. The actual event will be covered by TV stations as well, an unusual occurrence, I am told. Our church decorates the cross each Easter morning before the service. Members bring clippings from their gardens and everyone participates in the Flowering of the Cross. A great way to begin the day. 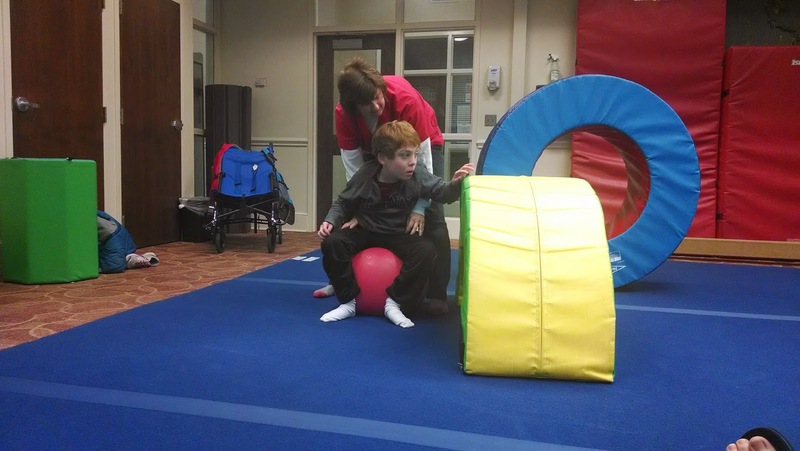 Since Ben was first diagnosed with delayed development at six months old, he has seen over 20 occupational, speech and physical therapists, and that does not include the ones at school. Most of these therapists provide in-home services so we do get to know them well. When it is not a good fit, they leave after a few weeks or months. Others stay with us for a few years building a strong bond with Ben and our family. Sarah R. was Ben's OT for over two years. She was one of those therapists who built a strong relationship with us. She involved Logan and Sean in sessions when they showed interest. When Ben started using the NOVA Chat, Sarah embraced it and incorporated its use in all of Ben's sessions. She helped develop ways for us to use it in everyday tasks. Sarah has been with us over this remarkable time of Ben's development, and she stepped up her game to challenge him. Throughout her time with Ben, Sarah made sure he was getting what he needed. She was instrumental in the psychological testing for Ben in the fall. She helped proctor the sessions. When I wanted someone to help at an IEP meeting, she gave her support by coming to the school and backing me up. Sarah decided to move on to a job that would require less daily travel. It was a quick goodbye - I, for one, was not ready for it. We miss her very much. I try to ready myself for these departures because they do happen often between Ben's teachers, community staff and therapists. Intellectually, I realize that people move on in their personal lives with a career or job change. Emotionally, I miss the ease of the relationship and the development gains that Ben benefits from these experts. Sarah holds a special place in our hearts, and is the first inductee for the Ben's Hall of Fame*. *Just made that up...I see a board in his room with photos of him with all of his special people. 1100 athletes will march into the Bojangles Coliseum. Last year, there were 20 spectators. Wouldn't it be great to have a large crowd cheering them on? Let's fill those stands and show our support. If you live in another state or county, find out when your local Special Olympics have their Opening Ceremony and go out and support the athletes. 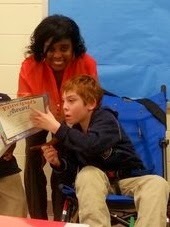 Each month, Ben's lovely principal gives out an award based on a character trait. Two students from each grade level, and two from the special education classes are chosen to receive the awards based on their behavior and actions the month prior. The students are honored in a short presentation. The principal gives each child a certificate, gets a photo taken with them and then the child chooses a special snack. The photos are placed on a board for the entire month. My mom and I were picking up Ben and inadvertently stumbled upon the presentation. It was our lucky day! 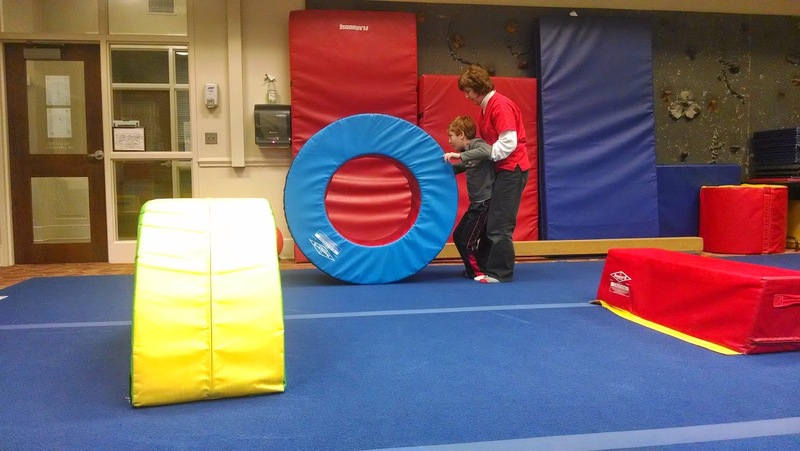 One cold day this winter, instead of swimming at the YMCA, Gale suggested they play in the gymnastics room and make an obstacle course for Ben to do. Take a look at what Ben got to do in this physical therapy session. It is hard to see Ben smiling in this video because the view is from the side, but he is smiling wide. Thank you to Joey for taking the photos and video. Recently, our fourth grader, Ben McCall, underwent a re-evaluation for services. Sarah C. was the school psychologist coordinating the evaluation. I had never met Sarah before my first appointment with her to go over the process. Our last meeting was this past Friday and after almost three months of information swapping, meetings and email conversation, I feel that she is an ally for our son and most definitely a prized employee to the school system. Right from the beginning Sarah was interested in hearing about Ben – at home, in school and out in the community. Although she gave us many forms to complete, she allowed me to share stories that demonstrated Ben’s abilities. She read my blog to find out more about Ben’s life. Sarah did all the expected things – visited him in class, talked with teachers and therapists, but she also went far beyond the call of duty. At the same time that this re-evaluation was happening, Ben was being tested privately by a neuropsychologist. The tests being used would be helpful to Sarah’s report on Ben, and she could easily have received them from me. Instead, she attended the feedback meeting with this doctor. She was able to hear everything first-hand, ask questions and learn more about Ben. If that was not enough, Sarah made a home visit to see Ben interact with his two brothers. She knew from my reports verbally and from reading my blog that Ben had a strong relationship with his brothers. That visit paid off in many ways – Ben gave Sarah a big hug when he saw her the next time in the classroom. Ben is an unusual child with special needs – he does not have a specific diagnosis and he does not fit into any category. It is hard to define him, and if you use a paper and pencil test and quick observations, you will not do him justice. You will miss out, in turn, dismissing him and his great abilities. Sarah clearly did not do this with Ben. We were blessed to have someone compassionate like her take the time and energy to delve deeper. Ben will benefit a long time from her work. Don't forget the people in your life that are special. If you have not read Part 1 and Part 2, then catch up here. For a quick summary - Ben participated in IQ testing over the past several months with a neuro-psychologist and the school psychologist. Part 3 will review the results. After each of Ben's testing sessions with the neuro-psychologist's team, the doctor called me to brag about how well Ben did on each portion of the test. Many months have past since the actual testing and the feedback meeting. It has taken me a long time to write this. I was not sure how to approach it - it was a lot to take in for me both intellectually and emotionally. Digesting it all and then writing about it was a hard task. I started this post numerous times. At the feedback meeting, the neuro-psychologist gave us information about the tests, the scores and what they meant. I am not getting into the scores because they are just numbers. I don't think I could do justice to the meaning of the numbers and the test descriptions. If you want to know more, send a comment or email to me and I will send you more detail. 1. Ben learns best by seeing, rather than hearing. 2. Ben's understanding of vocabulary is high. This means his receptive language is good - when we speak to him, he understands most of what we say to him. 3. Putting together puzzle pieces or building blocks into shapes are difficult tasks for Ben. This could translate to abstract learning is more difficult than concrete learning. 4. One and two step commands are easiest for Ben. Overall, Ben's scores were much higher than his school psychological testing in 2011. Of course, this time the tests were given in a much different manner (NOVA Chat, private OT helping) and Ben has developed quite a bit in the last three years. Right after this feedback meeting, we also had Ben's three year school re-evaluation. The school used these new testing results as well as additional testing to update Ben's IEP. For most everyone who knows Ben, these tests only confirmed what we have known about Ben: He has a lot going on in that brain of his, but it is hard for him to get it out. These tests validated my own thoughts. I have proof now when I talk about what Ben is capable of accomplishing. Armed with these new test results, Ben will go into middle school with a thorough and well-planned IEP. I personally feel like I have the ammunition to ask for more services, challenging work and higher expectations for Ben in the classroom. Already at home, we have updated his goals in our at-home programs. Ben has more responsibility and a few chores. He empties his book bag each day, makes his bed (one corner) and puts his laundry in his drawers. All this is done with assistance, but he does understand the task and what he needs to do, even if he completes the task with the same reluctance any ten year old has about chores. 1. Choose a doctor who will truly listen to your child's needs for testing. Ben was able to have his NOVA Chat in some of the testing. We also asked our private OT to help with the proctoring. 2. Be sure the doctor chooses accurate tests based on your child's needs. 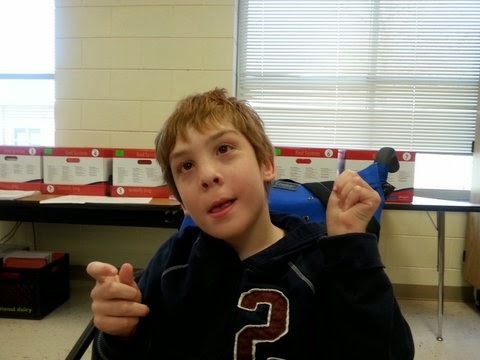 Ben is non-verbal so special non-verbal tests were used with him. 3. Use an appropriate testing environment for your child. This is funny, but it happened: Ben was enamored with one of the female proctors in the testing room. They had to ask her to leave because she was disrupting Ben's attention. 4. These tests need to be put in their proper perspective. Sometimes testing will not go well - child will be sick, not in the mood or the test just does not work for your child. Other times, everything will fall into place and the scores are what you expect. Or perhaps you think your child should have scored higher. It can be emotional either way - scores high or low. Before you get into testing, have a clear plan for what the test scores are for - school, home, future goals. Understand why you are testing and for whom the testing is for. Ellie, the grandma, contacted me this week about a fund raiser to help build Ellie a therapy pool. This is the link - feel free to read and share: Therapy Pool Fund Raiser.